As we discussed yesterday, another storm will begin to affect Colorado today through Thursday bringing at least a slight chance of rain and snow to Denver. The eventual track of this system was the biggest uncertainty yesterday, as only a slight shift would mean a greater or lesser chance for shower activity in Denver and the northern Front Range communities. 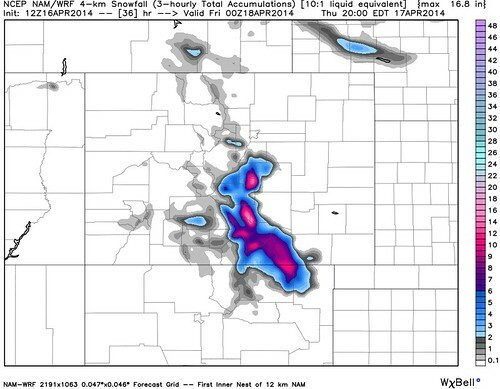 18z model runs yesterday trended south, away from Denver, and the 0z runs last night did little to change this idea. We'll stick with cool and unsettled for Denver this afternoon through Thursday, but temperatures are not looking as chilly Thursday as they once were, and precipitation chances will be low. South of Denver the forecast remains interesting. The National Weather Service has issued a Winter Weather Advisory for areas west of Colorado Springs which we outlined yesterday could have the best chance for appreciable snowfall. Currently thinking 4 to 8 inches will be possible there (at elevations >6700 ft), but will need to watch for another southern shift in precipitation. 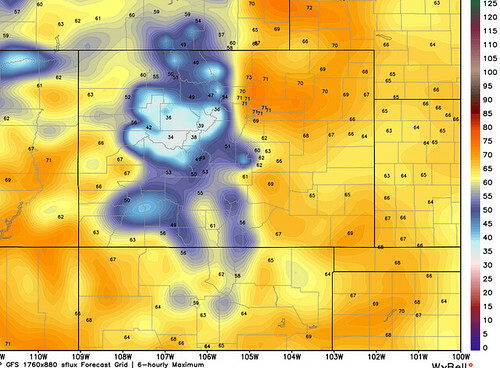 The hi-res HRRR looks very similar, though may try and keep bulk of moisture south of Colorado Springs. 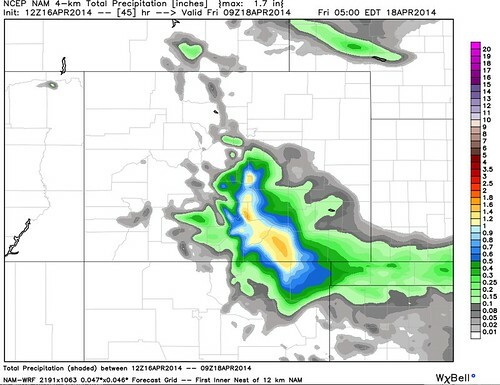 Notice how both of these models keep Denver and northeast Colorado virtually dry through Friday. This could very well be the case -- but we think there will be just enough ingredients in place to keep a chance for showers this afternoon and overnight Wednesday into Thursday for the Denver area. Again, not expecting much in the form of measurable precipitation in the city, but something to keep in mind if you're headed out and about, especially if you're headed south. Temperatures will spring back nicely Friday, with highs expected back near 70 degrees for much of eastern Colorado by Friday. Easter weekend looks mostly pleasant for the state, but we'll need to track the chance for thunderstorms Saturday, and at least a slight chance for rain on Sunday. Neither day of the weekend looks particularly cold however, with highs in the 60s likely both days.